Do More Posts Equal More Page Views? Last week, I found myself extremely busy. Between my day job, normal life activities, and a freelance job I had taken on, I had virtually no time left for blogging. I felt bad, but except for one small "I’m still here" post, I didn’t post at all. Over the years I’ve been blogging, my posting schedule has changed. I used to post on an erratic basis. Later on, I settled down to one post every weekday. At some point last year, though, I was feeling burnt out and decided to cut back to only three posts a week. That’s the level it has stayed at since, but some weeks still had more posts than others. Perhaps I simply felt like I had more to say and couldn’t wait for the next week. Or, maybe I was experiencing blogger’s block and couldn’t think of anything to write about. Having a week with only one blog post led me to wonder: Do slow posting weeks equal less page views? 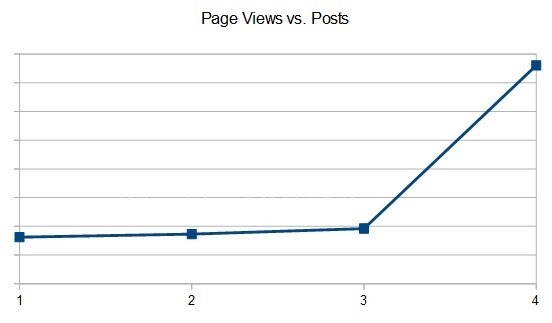 Do more posts published mean more page views? This was easy to test out. First, I looked at my Google Analytics for 2014. Thankfully, Google makes it easy to export your data. First, I loaded up my data for the year. Next, I arranged it into a weekly format. 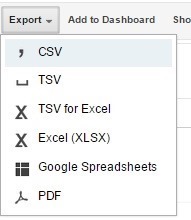 Then, I exported it as CSV (comma separated values) to import into my spreadsheet. 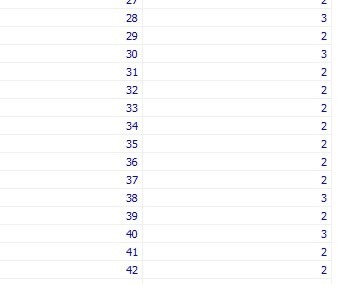 Next, I used a mySQL query manager to see how many posts I made every week of the year. After obtaining these pieces of data, I figured out how many page views I experienced, on average, when I had one, two, three, or four posts in the week. (I haven’t posted five days a week this year.) This gave me this graph. At first glance, it would appear that posting four times is ideal and leads to immense growth. Unfortunately, all of that traffic came from one period where a post of mine went viral. (Or as viral as my posts get.) The traffic that one post obtained was completely out of proportion to normal post traffic. The fact that I posted four times that week was a coincidence. I could have made that my only post that week and would have still beat out the other averages. Ignoring the four post week data, then, we see that there isn’t a big difference between a one post week and a three post week. 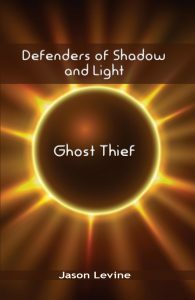 This fits in line with a theory I’ve had for awhile. When I was starting out, I felt the need to publish posts as often as possible. I felt that not pushing new content out constantly would mean an immediate drop in readership. Then I began to notice some websites that would update only twice a week or even less. Though I wasn’t privvy to their exact numbers, it was clear that these sites had traffic figures far outpacing my own. If readership numbers were truly tied to new content, how could a "one post a week – maybe less" posting schedule lead to more traffic? The answer, of course, is that traffic is tied to many things. Chief among these are content quality and spreading the word. You can post five times a day, seven days a week, but if you are posting horrible content, you aren’t going to be driving a lot of traffic in. On the other hand, posting once a week can be perfectly fine if your posts are well-crafted. As far as spreading the word goes, of course everyone knows we live in a hurricane of content. There is just too much out there for one person to ever take in. Even if I quit my job and gave up everything including essential activities such as sleeping and eating, I could never view even 1% of the new content that is created daily. Two years ago, DOMO made an infographic showing just how much data was created. They estimated that 48 hours of YouTube videos were uploaded every minute and 3,600 new photos were shared on Instagram each minute. Given that this was in 2012, these numbers have likely risen. Even at those levels, however, viewing everything is simply impossible. Given that viewers have a flood of content to swim in, getting the word spread about your content is ideal. I know I lag behind in this. I honestly don’t have the time to spend crafting unique custom scheduled tweets or actively monitoring Twitter (much less a few other social networks) posting reminders to people about my great new post. My content spread is regulated to automated tweets via a WordPress plugin. Still, every bit has got to help. In the end, it doesn’t matter whether you post every day or once a week. Take your time and craft your post so that the final result is great and draws traffic. Don’t just spit out post after post merely to increase how many posts you’ve made this week. What steps do you take to increase your page views? Do you find your page views increasing when you post more often?